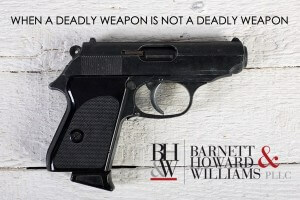 The “deadly weapon finding” under Texas criminal law is an issue that leads most criminal defense lawyers to bang their collective heads against the courthouse wall. It seems that just about anything and everything is, has been, or will soon be, designated as a “deadly weapon” when the prosecution deems it helpful to securing a conviction and lengthier sentence. Here are some deadly weapons that we’ve seen recently: car, fist, baseball bat, walking stick, STDs, fire, fake gun, etc. In the case below, the Texas Court of Criminal Appeals finally ratcheted back the power of the State to enhance a case with a deadly weapon finding. Kudos to the 1st Court of Appeals (Houston) for stepping out on this issue. Question Presented: To support a deadly-weapon finding, must the “exhibition” of the deadly weapon facilitate, in some manner, the felony offense? Or is it sufficient that the exhibition of the deadly weapon occurs simultaneously with the felony but is unrelated to its commission?